I was back on board again, and I ate like a Viking! This time around, I visited a different ship resting in SM North Edsa, the Block. I am talking about the Vikings Luxury Buffet Restaurant. 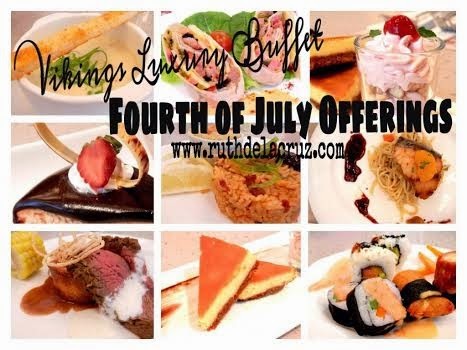 I was invited to try out their latest offerings for the Fourth of July - an interesting offering that would replace the All Filipino Offerings they featured for the month of June in celebration of Philippine Independence Day. Vikings really understands luxury with a grand ambiance of the SM North EDSA store. Beautiful couches, shiny floor, glass divisions and fancy chandeliers. Vikings stores have different interiors to give their guests a different dining experience everytime they visit a different Vikings store. When I arrived, I was escorted to the function room where the rest of the other foodies were waiting. I checked the menu and I've seen.. 1st Main Course.. 2nd Main Course.. 3rd Main Course.. Wait, what? Did I read it right? Even for a "plated" event, Vikings does know how to "satisfy the guests"! Click Read More to know more about the Fourth of July Vikings offering..
Let's start with the Appetizer.. The Tortilla Club Sandwich is love at first bite for me! It doesn't sound and taste like an appetizer for me, but a complete meal. There's Turkey Ham combined with Sweet Ham, Cream Cheese and Black Olives wrapped in a fresh, soft tortilla. The fresh green, and sweet bite of cherry tomato are just perfect in terms of hue and flavor. Next.. the Chicago Summer Corn Salad. I have this feeling that my mom would love it. This is something that I would keep on the side of the plate, to eat in between bites of meat. A good, refreshing dish to enjoy with a heavier meal. Before we jumped to the heavier meals, we got a taste of Japanese food through hybrid sushi rolls named after interesting places in United States! The white rolls with light white noodles and caviar eggs are called Niagara Falls (oh, remind me to write about my experience about our trip in Niagara Falls!). As geography told us that Niagara is the border of US and Canada, this roll would give us a border taste of sweetness with mango and avocado, and citrus flavor of sashimi with vinegar and Japanese soy sauce. The Maryland Maki (with nori wrap) is a sweet roll of carrots, asparagus, crabstick and chicken teppanyaki with creamy strawberry sauce and mango puree. Maguro Haru Maki is not your typical sushi roll. A unique spring roll with tuna and vegetables inside. What makes it the bomb is the mango puree, that is cooked perfectly it tasted like cheese sauce. This got to be one of the stars that afternoon (and I am giving it 4 out of 5 stars!). For the soup lovers, here's Boston Clam Chowder Soup! Vikings' resident chef shared that the real Chowder Soup comes with all the 4 ingredients - celery onions, potatoes, carrots and clam. Although I am not really a fan of seafood soups, I still enjoyed the bowl. It is creamy, yet light. Perfect puree that is not made of cornstarch. For the 1st Main Dish, we were served with California Grilled Fish on Agli Olio with Roasted Bell Pepper. At first look, the pasta looks dry, but when you tasted it, you would feel the textured Parmesan cheese embracing every pasta strand. I am not really into oil-based and cream-based sauces, but I wouldn't mind having a second serving of the Agli Olio pasta. The California Grilled Fish is a Gindara Fish marinated for 24 hours with orange marmalade, sugar, chicken powder, lemon juice. The marinated sauce was then caramelized to make a sweet-citrus sauce. The fish is fresh, flaky and flavorful. The fish-pasta combination is perfect. Vikings has such innovative and creative roster of chefs! I am impressed. The Lemon Sorbet was served to us to cleanse our palates. It is strikingly sour and sharp for my liking. A biting taste that would kill you, but would make you get another spoonful. When we were served with this plate, my tummy was already complaining, but my tastebuds were rejoicing. It was not easy which sense to listen to..
Indiana’s Pork Loin with Cranberry Sauce is a tender smoky meat dish with interesting sauce. It goes perfect with the Jambalaya Louisiana Rice which is cooked with real tomato and 8 spices. It is not at all spicy and strong that complements main dish. While I found it a challenge to finish my plate, I enjoyed the Mississippi’s Turkey Sweet Potato which is boiled perfectly that seemed like it is exploding with every bite. The Viking's Shepherd’s Pie is an innovative dish made of sweet potato, making it taste a bit sweet-cheesy than the normal Shepherd's Pie. For our 3rd Main Course, we were served with Tenderloin Steak with two interesting sauces - the Red Wine Sauce and Horse Radish Sauce. Steak-lovers must not miss this, as this is served medium-rare, fresh and pinkish. It is chewy, juicy and seasoned perfectly with thyme and whole black peppers. Guests may request to have it served medium well or well. Enjoy the steak with Yorkshire Pudding and Corn on the Cob. Can I say that I can eat the pudding on its own? The Onion Hayes gave the meal an interesting crisp and crunch. The desserts were just as luxurious and decadent as the previous meal presented to us. A plate of these beauties perfectly fit the setting. They were so beautiful I could take pictures of them forever! I started with the New York Cheesecake. It is classic and simple. I am not sure if Vikings purposely make it a little less creamy (I know how Vikings team loves to divert and innovate), but I would prefer my cheesecake with that smooth feel in the mouth. I tried this beauty next.. and I was in heaven after the first bite. I so longed for a rich cake that is just all ganache and chocolate. Here's a bite closer to my dreams. Vikings call it, Boston Cream Pie. A layer of gelatin, white chocolate and dark chocolate. The slice of strawberry is seated on top of the whipped cream - and it was telling me, "yes, I am pretty, don't eat me". I love strawberries, and the spoonsfuls of Cherry Cashew Parfait perfectly toned down all the chocolate-y evilness I had with Boston Cream Pie. Okay, this is what I hate about food blogging.. I am now craving for all these interesting yummy offerings from Vikings! Peach Kitchen and I were just talking how, when we felt so full and satisfied after the food trip, we would suddenly craved for every piece and part of it once we were back in our rooms and sharing our food stories. I love the exquisite offerings of Vikings Fourth of July! Each dish is a celebration of American tradition and culture, made even more interesting with innovative twist on ingredients and preparation highlighting the skills and talents of Vikings' roster of chefs. The play of words and names make an appetizing journey to discovery of good food. Of course, a trip to Vikings is not complete with a photo-opp! Awesome chefs behind the awesome food! We are now close to the end of this post, and before you run to the nearest Vikings' store, we have a special announcement. Birthday Celebrants can avail of the FREE MEAL at Vikings Luxury Buffet Restaurant on their birthday, and THE WHOLE BIRTHDAY MONTH! How does the new Vikings Birthday Promo work? 8) This promo is available across all branches. 9) This promo is available until December 31, 2014. 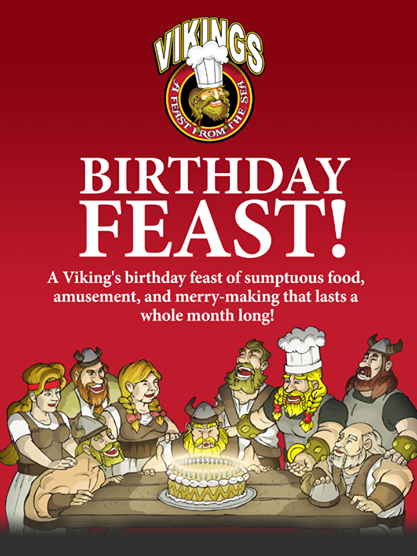 Birthdays are more awesome at Vikings, yes?